Focus for the New Year! 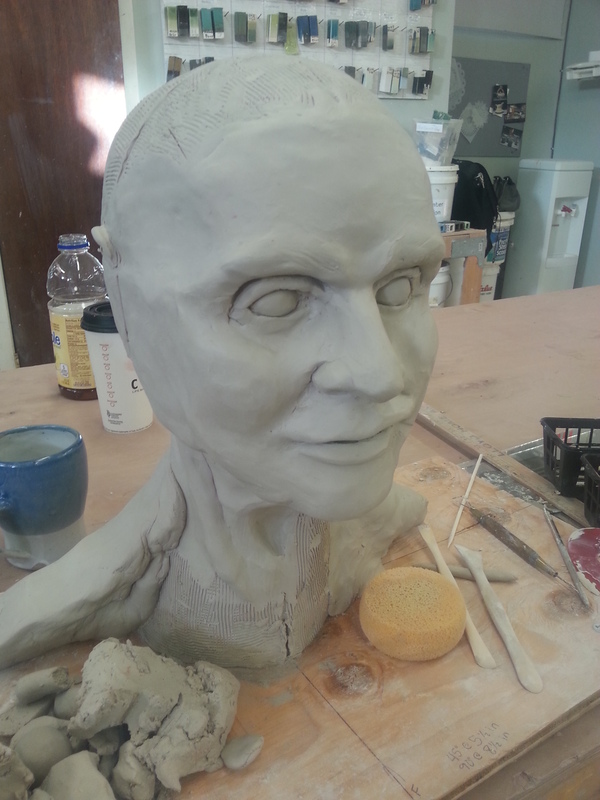 Last semester I began an inquiry into human emotion through facial expression and portrait bust sculptures. 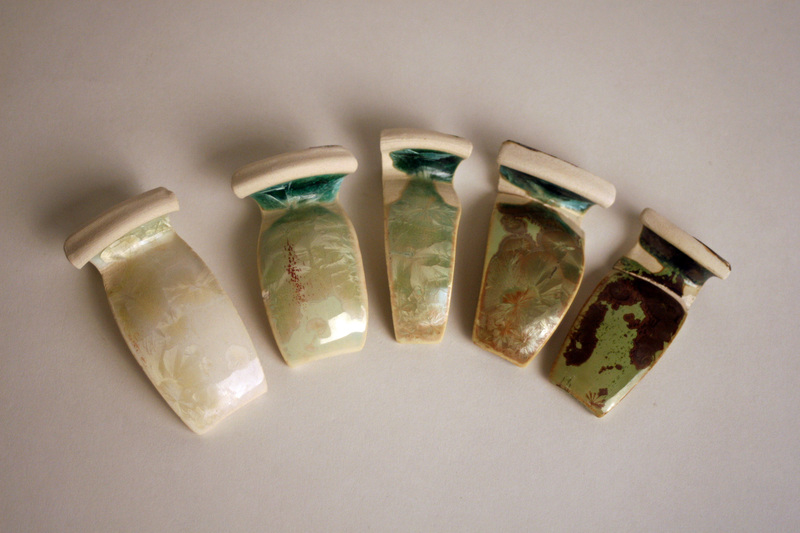 I also did much research through discovering the complexities and color variance of crystalline glazes. I would like to finish the second bust that I began last semester, but more importantly I have new ideas that I want to explore. The idea of human emotion and expression is still the foundation of my research. However, in an effort to embark on a new form of figure sculpture, I’d like to focus on the art of tattoos. My main goal this semester is to create a series of body parts that are comprised of smaller detailed sculptures of tattoo subjects. For example, a dragon and cloud tattoo on an arm would be a sculpted dragon and clouds that form the volume and shape of a human arm. Content : Choice in tattoos usually holds deep cultural and personal meaning for individuals. They physically express emotions through chosen artwork by the wearer instead of natural emotional expression through body language and facial gestures. Context : I’m trying to relate this form of personal expression with my previous study in emotional facial expression. Format : By sculpting the individual imagery-objects of a traditionally inspired Japanese style tattoo, I will then construct the human body with these pieces. Making Method : Handbuilding. Detailed carvings. 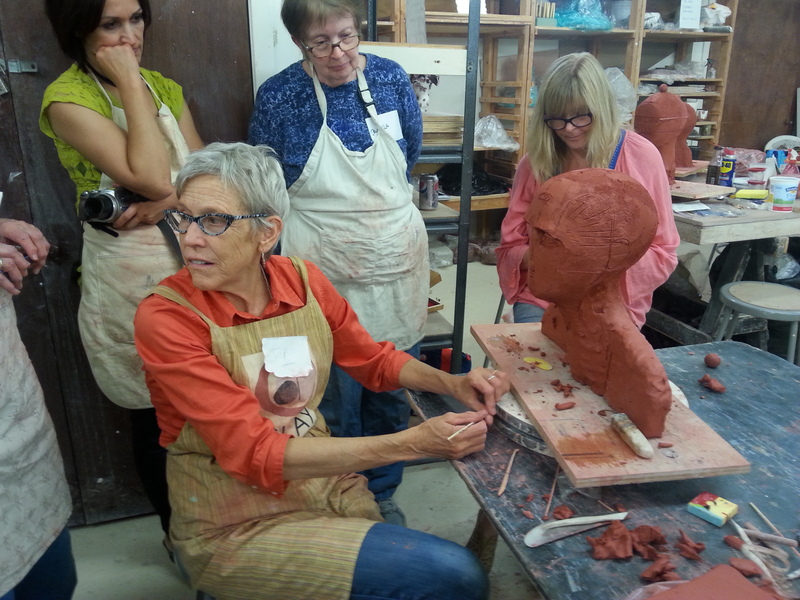 Six facial studies in order to gain an understanding of portraiture through clay. Photos and sketches to be kept alongside practice portraits for comparison. Glazing/staining undecided at the moment, but interested in keeping a natural look. These expressive portraits will hollowed out and then able to open along a hinge or sliding base that separates the pieces in order to reveal abstract forms hiding within. Several abstract bulbous sculptures that represent the inner emotions and experiences of the portrait personalities made in the previous projects. Spherical orbs will be altered to represent such ideas as physical abuse, heartbreak, child-like innocence, depression, etc. 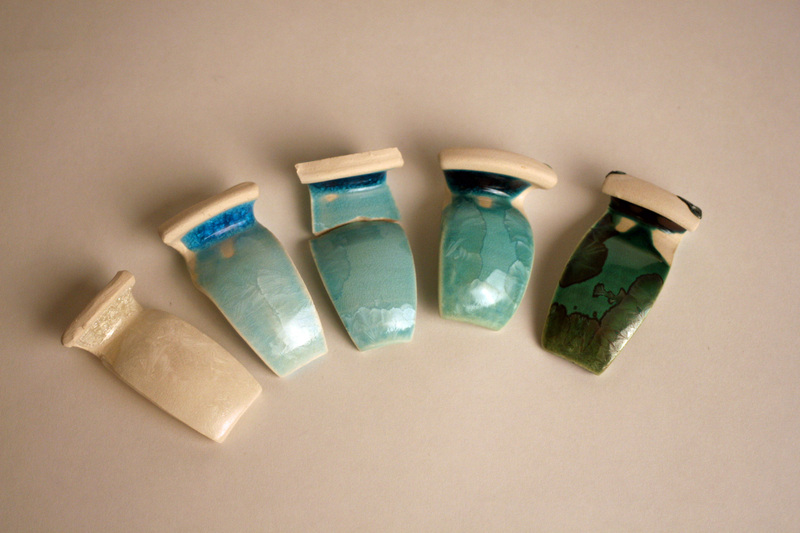 I will eventually combine my research in crystalline glazes to encourage more crystal development in the “damaged” areas through seeding. This will show how difficult life experiences lead to beautiful personal development. Well, what can I say? Grad school is a little bit different than what I expected, but mostly in really positive ways! In addition to making new friends and being covered in a pile of reading, I’m learning a lot about working on teams and how to plan and research my ideas before starting them. Thus far I’ve spent the majority of my time searching for the perfect clay body. I began looking through Val Cushing’s Handbook and taking suggestions for recipes. 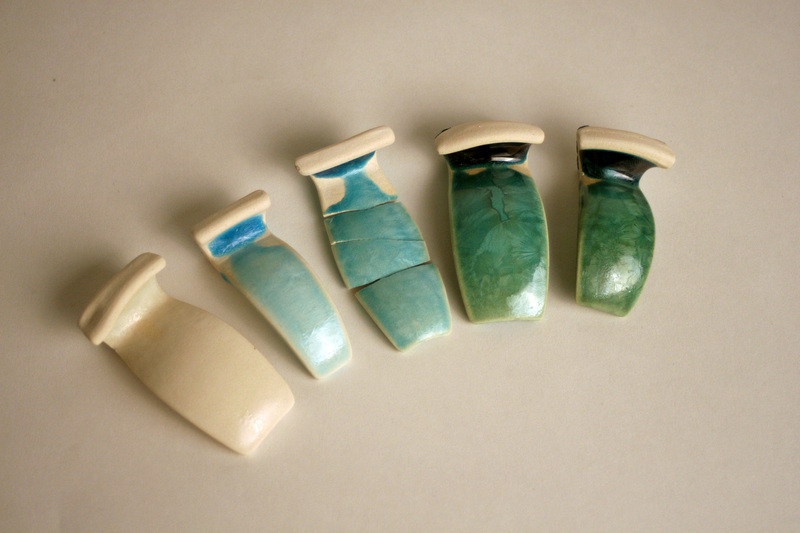 I was looking for a cone 6 white body and a cone 10 porcelain. After making eight batches of 1000 grams each, I finally settled on two recipes based on their throwing abilities. The cone 6 white body is a recipe from a student of Andrew Martin, and it has the versatility of adding fine grog for sculptural work. 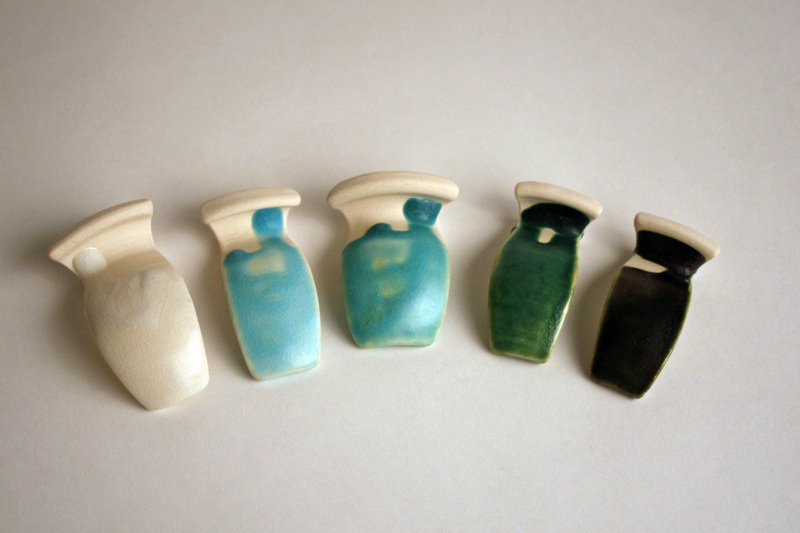 The porcelain I chose was Jeff Cole’s translucent recipe, and it was perfect in test form. However, learning is usually about making mistakes. I made an incorrect substitution in my large batch and have some work ahead of me to correct it. I know I won’t ever make that mistake again, but I’m glad that I have the guidance and support necessary to move forward. After all, this is just the beginning, and I’m excited to share where I’ll be going.